It was a match made in Tofino, appropriately born on Valentine's Day. They were married a few short months later. Not exactly a shotgun, but more like Cupid's arrow. Producing symbols of affection since they opened Chocolate Tofino on February 14, 2003, Gordon and Leah Austin embody what it means to be true chocolate lovers. Having immersed himself in it for over ten years, one might wonder if chocolate flows through Gordon's veins. Since moving to Tofino in 1991, he has worked his way up through the gastronomic ranks from dishwasher to award-winning chef to successful entrepreneur. After spending a year down-under, he returned to bc and finished his culinary training under the watchful eye of master pastry chef George Wagner at Nanaimo's Malaspina College in 1996. The following two years were spent as an apprentice in the kitchens of the Fairmont Chateau Whistler. Gordon returned to Tofino in 1998 and finished his apprenticeship under the tutelage of Matthias Conradi at the Wickaninnish Inn in 1999. His focus shifted from savoury to sweet and he took over from Conradi as the Inn's pastry chef when his predecessor went to pursue more independent ventures. During this time, he was the recipient of many awards, including first place in the prestigious Grand Marnier Award where he consistently won media choice. Following a demonstration by world renowned chocolatier, Bernard Callebaut, Gor- don discovered his true calling. Despite a background in social services, Leah spent time in Whistler's hospitality industry before running an eco-resort in southern Thailand for a year in 1999. Upon returning to Canada, she detoured to Tofino, where she landed a job as night auditor at the Wickaninnish Inn. It was there she and Gordon met. Leah immediately recognized his talents, evidenced by missing chocolates, pralines and truffles at the start of Gordon's shifts. Originally from Sault Ste Marie, being surrounded by trees and nature in rural northern Ontario has always been a big part of Leah's life. Her father lived in Vancouver and would often bring her camping in Tofino throughout her childhood. Gordon grew up a world away. The son of missionaries, he lived in Hong Kong until the age of eight when he moved to Taipei. It was on the eastern shores of Taiwan that Gordon was introduced to the surfing life. After his eighteenth birthday, Gordon moved to Vancouver where he heard about the waves off Tofino's beaches. His first visit was in 1989. Shortly thereafter he built a squat on Poole's land and began his professional journey towards Chocolate Tofino. Opened on a dare of sorts, Chocolate Tofino started baking custom birthday and wedding cakes, and providing desserts for local restaurants. It soon began specializing in chocolate, ice cream and gelato. Everything is home-made on-site in their 250 square foot shop using only natural ingredients with no preservatives. Gordon prefers to adhere to classical chocolate techniques rather than fly-by-night unorthodox flavourings and fads such as chilli-chocolate. Product quality is uncompromising. Low inventory keeps their creations fresh, and nothing is kept for longer than a week. Hence, their chocolates are only available locally, mostly at their store or at selected hotels, gift shops and galleries. Whether wildflower honey from Port Alberni, or local blackberries used to make the reduction for the truffles, or lavender picked from their own garden, an effort is made to source all ingredients locally. But, Gordon and Leah take this philosophy one step further. Most chocolate in western markets originates from Africa, where trade is less than fair and farming is less than organic. Cacao trees which produce cocoa beans only grow within 10 degrees of the equator. Consequently, the closest growing region for Canadian chocolate is Central America - specifically Costa Rica. For the past few years, Leah and Gordon have been spending much of their winters in Costa Rica where they "lived on the farm and off the land". They prefer a rustic travel experience where they can get up close with the local culture, and are educating local farmers how to produce quality chocolate by developing a unique process from raw bean to finished product. Next winter they plan to take part in the harvest. Chocolate goes through an extensive journey before it ends up in our mouths. Much like coffee beans, cocoa beans are picked, fermented (4-7 days) and sun-dried (2 days) before being roasted. Once roasted, the husks are removed and the beans are ground into a paste called "cacao liqueur". This paste goes through a "conching" process where, according to French purity laws, it is ground exclusively with sugar, vanilla, soy lecithin and, in the case of milk chocolate, dairy products. Conching lasts anywhere from 18-36 hours. It is the "cacao liqueur" that Gordon and Leah seek to import from the organic and fair-trade farms of Costa Rica that will undergo Gordon's secret conching recipe that produces the chocolate many of us enjoy. In fact, their goal is to partner with such a cacao farm so they can play a part in every stage of production. Gordon and Leah take hands-on involvement and the concept of all-in-the-family one step further. Local staffing shortages have compelled them to employ Gordon's retired parents from Abbotsford for the summer. Professional chefs operate in a highly competitive industry, and although Chocolate Tofino participates in most regional festivals, including the Tofino Food and Wine Festival, the Oyster Festival in Tofino and High on Chocolate at Mount Washington, Chocolate Tofino is not about competing - it's about making people happy. And a visit to Chocolate Tofino is bound to put a smile, and a few drops of gelato, on anyone's face. 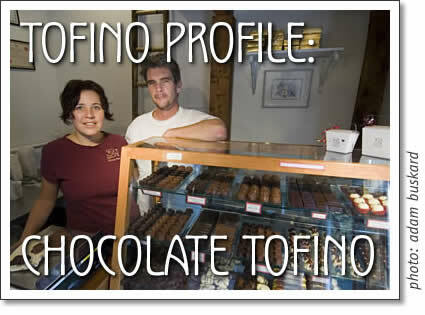 Chocolate Tofino - A Tofino business profile by Alex Nicolik for Tofino Time Magazine.